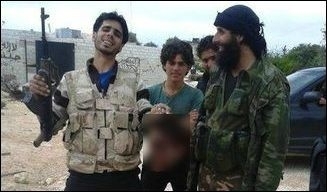 Note: MEF has blurred or excluded some of the beheading photos displayed in the original FrontPage article. To understand why the Islamic State not only decapitates its "infidel" captives, but also mutilates and mocks their corpses—and all to sadistic laughter—one need only turn to the Koran and deeds of Islamic prophet Muhammad. The Koran exhorts believers to "Fight them [those who oppose Islam], Allah will torment them with your hands, humiliate them, empower you over them, and heal the hearts of the believers, removing the rage from their hearts" (Koran 9:14-15). As usual, to understand the significance of any Koran verse, one must turn to the sira and hadith—the biography and anecdotes of Muhammad, respectively—for context. Thus we come to the following account concerning the slaughter of 'Amr bin Hisham, a pagan Arab chieftain originally known as "Abu Hakim" (Father of Wisdom) until Muhammad dubbed him "Abu Jahl" (Father of Stupidity) for his staunch opposition to Islam. After 'Amr was mortally wounded by a new convert to Islam during the Battle of Badr, Abdullah ibn Mas'ud, a close companion of Muhammad, saw the "infidel" chieftain collapsed on the ground. So he went to him and started abusing him. Among other things, Abdullah grabbed and pulled 'Amr's beard and stood in triumph on the dying man's chest. 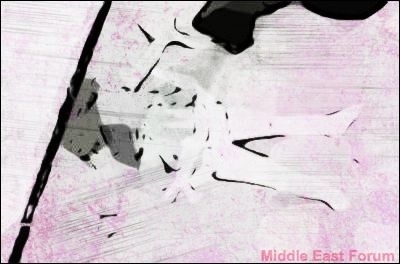 According to Al-Bidaya wa Al-Nihaya ("The Beginning and the End"), Ibn Kathir's authoritative history of Islam, "After that, he [Abdullah] slit his ['Amr's] head off and bore it till he placed it between the hands of the Prophet. Thus did Allah heal the hearts of the believers with it." This, then, is the true significance of Koran 9:14-15: "Fight them, Allah will torment them with your hands [mortally wounding and eventually decapitating 'Amr], humiliate them [pulling his beard], empower you over them [standing atop him], and heal the hearts of the believers, removing the rage from their hearts [at the sight of his decapitated head]." The logic here is that, pious Muslims are so full of zeal for Allah's cause that the only way their inflamed hearts can be at rest is to see those who oppose Allah and his prophet utterly crushed—humiliated, mutilated, decapitated. Then the hearts of the believers can be at ease and "healed." This is surely one of the reasons behind the Islamic State's dissemination of gory videos and pictures of its victims: the new "caliphate" is trying to heal the hearts of every believer inflamed for the cause of Allah. If this sounds too farfetched, consider the picture at left of a decapitated "infidel" from the Islamic State's websites. The Arabic caption to the left says "healing for hearts"—a clear reference to the aforementioned Koran verse. Koran 96:15-16 also alludes to the fate of 'Amr and offers more context applicable to the Islamic State: "No! If he does not desist, we will surely drag him by the forelock—a lying, sinning forelock." According to al-Alusi's tafsir, or exegesis, after Abdullah placed his foot on the dying foe of Islam, 'Amr opened his eyes and recognized him. The once proud chieftain lamented that he was being killed by a common "goat herder," to which Abdullah replied, "Islam elevates and nothing is elevated above it." He then sheared his head off. "But he could not carry it, so he made holes in the ears and put thread through them and dragged the head to the prophet. Then Gabriel, peace be upon him, came laughing and saying, "O prophet, you got an ear and an ear—and the head between for a bonus!" In order to demonstrate that the enemies of Islam have been brought low, as Koran 9:14-15 promised, Islamic State members often make it a point to place their feet atop their fallen corpses, most of which were first decapitated. The ubiquitous black flag of Islam is always raised above the fallen "infidels"—a reminder that "Islam elevates and nothing is elevated above it," as Abdullah told 'Amr, with his foot on his chest, before beheading him. See photo at right. Other photos are reminiscent of how 'Amr's head was treated: mutilated and dragged on the ground. In short, not only are the members of the Islamic State closely patterning themselves after Muhammad—whom Koran 33:21 exhorts believers to emulate in all ways—but even in the most sadistic of details are they finding support in their prophet. Nor should it come as any surprise that Muslims are aware of these accounts from early Islamic history. After all, the near hagiographic Battle of Badr, including the story of 'Amr's slaughter, is routinely glorified worldwide in mosque sermons, on Islamic satellite stations, and in Islamic texts. It is a source of great pride. Thus when young Muslims express their anger and frustration at the state of affairs of the Islamic world, their clerics council them to go to the jihad in Iraq and Syria and decapitate themselves an infidel—which, according to the Koran, should "heal their hearts." Perhaps that's why a British female convert to Islam is so eager to "behead Christians with a blunt knife"? Perhaps that's why a jihadi savagely pulled out and bit into the heart of a fallen Syrian soldier—to heal his own heart by sating his rage against Allah's "enemies"? Such Muslims join the jihad, and not only do they decapitate, but they mutilate, humiliate, and laugh at the disgraced enemies of Allah—in perfect emulation of the Islamic glory/gory stories they grew up on. This is the true cult of jihad that few non-Muslims can begin to comprehend—and little wonder, considering that their political leaders, professors, and media continue to babble foolishly about how Islam is the "religion of peace." *** Thanks to Rachid for compiling and presenting the above pictures and accounts.